A Textbook is required for all Japanese Learning Center Courses. You can buy the textbook (New or Used) through Japanese Language Center if you like, or you may acquire your text through your local bookseller. Payments may be made via online and also cash or check (pay to JLC) are acceptable. Please contact us about the price of used textbook. For On-site Group Lesson, we will provide textbooks as a part of the package at a nominal charge. We offer online payment for all course textbooks used in our classes. The texts will be ready and waiting for you when you arrive for your first lesson. All online payments are through , the leading e-payment payer. All transactions are conducted using a secure, encrypted connection. PayPal is the pre-eminent online payment system. You will need a credit card (Visa, MasterCard, Discover or American Express) to complete the transaction. ** Note: there are two (2) possible textbooks for Japanese 101-103. They are essentially the same book, however the Kana version has more emphasis on reading Japanese and you must learn all Hiragana to read this book. The Kana version is required for Group Course. If you sign up Private Course and want to focus on conversation, the Romanji version may be another option for you. Contact us if you are unsure of which version to buy. 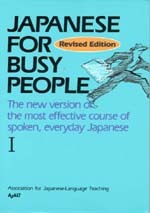 *** Note: There are several editions of JAPANESE FOR BUSY PEOPLE II and III. Some editions with less Kanji are too easy for our Japanese 201-303. If you buy a text at a bookstore or book seller, please make sure you purchase the below noted ISBN for the text. This is very important, pleased be careful about this point.